Why Should You Install Privacy Louvers? Privacy louvers are great for commercial areas. Privacy louvers are especially useful for commercial spaces and business owners. They provide excellent privacy in a way that it still inviting and not obstructive. Depending on the area that surrounds your business, you may find it necessary to install a way to separate your commercial space from the business or residential communities around it. To make your business more exclusive or to ensure the privacy of your clients and customers, privacy louvers are a great way to make your space your own. Here are some reasons why you should install privacy louvers tomorrow! Installing a louver serves a similar purpose as installing a fence, especially when it comes to added security. When you look at the exterior of your commercial space and think of ways you can make it more exclusive and secure, adding a privacy louver should be the first addition that comes to mind. It’s a simple feature yet very effective. Not only does it limit the visual access to your space, but it definitely limits the physical access to your property. 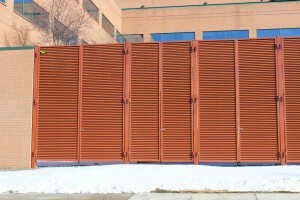 Unlike other fencing options, louvers are much more difficult to scale by would-be burglars. They are strong structures that you can count on for many years to serve their purpose in a reliable, low-maintenance way. This is even more important if your business uses particularly sensitive materials, like client financial or medical records, or expensive equipment like state-of-the-art computer technology. You’ll know that your privacy louvers are adding privacy and security to your commercial property, but visitors, clients, customers, and other people in the community will just see a beautifully designed landscape. Louvers can take on many different design features, including ornamental details that could include various aspects of your company branding, especially the color. Louvers are a great alternative to fencing if you’re looking for a sturdy structure with a specific design that fencing doesn’t exactly deliver. Although there are many design and material options that you can get from fencing, the look and aesthetic appeal of louvers is undoubtedly unique. This entry was posted on Friday, December 22nd, 2017	at 2:34 pm	. You can follow any responses to this entry through the RSS 2.0 feed. Both comments and pings are currently closed.